I keep forgetting that a.) bartender Amanda is, like, a super talented chef, and that b.) Jordan is as giddy as a schoolgirl when it comes to playing with his food until it becomes drinks. This week, they also want to play with sharp stuff and are making a bunch of purees. 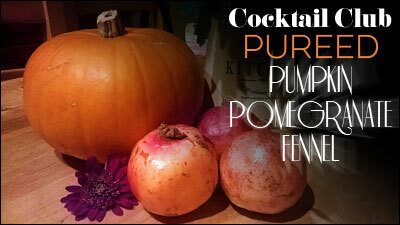 Fennel, pumpkin, pomegranate, and other stuff that looks, you know, good. If there’s one thing I can tell you about purees, it’s that they’re not gonna appreciate themselves. So you have to. That’s the way it has to be. Love you. Thursday night, 6ish, until someone loses a finger in the pureeifying machine.